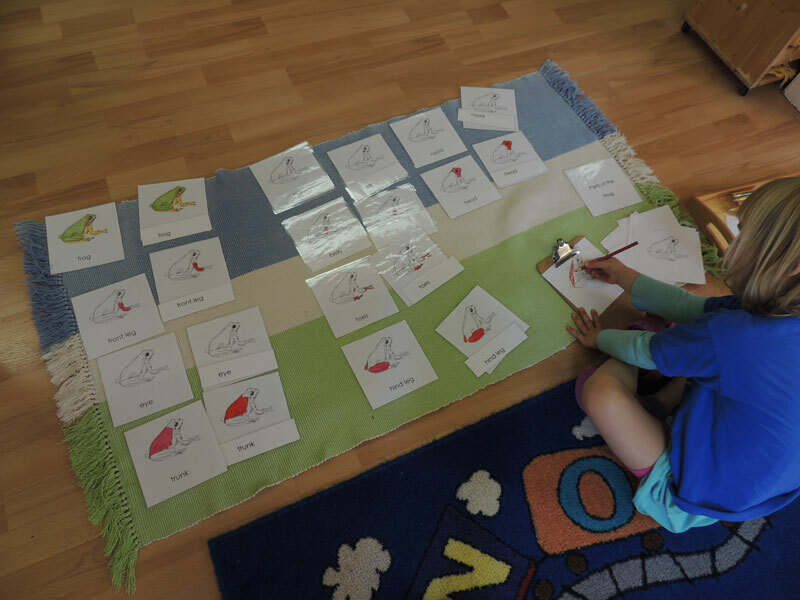 In the Montessori program children have the opportunity to learn about the physical world, including the language and classification of plants, animals, the landscape, and other features and products of the earth. The no menclature cards and booklets in the cultural area of the classroom illustrate and name the various parts of the tree, leaf, flower, snail and so forth. The work with the nomenclature cards involves matching the illustrations with corresponding labels to learn the names of the parts. For example, the parts of the snail cards depict: Shell, foot, mouth, tentacles, eyespots. Each part is isolated in colour to draw attention to that particular part. The work with the nomenclature cards helps children to become observant of the characteristics of things that grow in their environment. Plants, flowers, and vegetables that are grown in the school garden can be brought indoors to study along side the matching cards. Children also spontaneously bring in their own bugs, rocks or shells from home or a trip to observe and study at school. 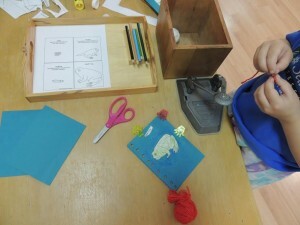 This spring the children at our school have been learning about the life cycle of the frog. An aquarium was created for the classroom to house tadpoles from the American Bullfrog species. The three-year metamorphosis allows for first hand observation of the various stages of development from young tadpole to froglet to adult bullfrog. The amphibian visitors also provide valuable opportunity for discussion about the effects on the environment of a non-native species. Resource books, storybooks, songs, and wooden puzzles about frogs add opportunity for learning and discussion. The children extend the lessons with the frog nomenclature cards by making their own booklets depicting the parts of the frog. The book is bound together with coloured yarn, becoming a keepsake to read at home. Blog, Science life cycle, Outdoor, science. permalink.